Courts around America and the world increasingly rely on software based risk-assessment software in determining bail and sentencing; the systems require the accused to answer more than a hundred questions which are fed into a secret model that spits out a single-digit "risk score" that courts use to decide who to lock up, and for how long. The data used to train these models are a trade secret, closely held by the highly profitable companies that sell this service to courts. Unlike the rigorous machine-learning deployed by companies like Amazon, which retrain their models every time they fail (if Amazon shows you an ad it hopes will entice you to buy, and you don't, it adjusts its model to account for this fact), these models have no formal system for gathering data about their predictions and refining the model to see whether it is performing well. The predictions themselves can only be described as racist. Though the questions given to subjects don't directly deal with race, they do address many of the correlates of race, such as poverty and acquaintance or relation to people with police records. The recommendations that the systems spit out -- a single number between one and ten -- recommend harsher sentences for brown people than for white people. Propublica investigated the predictions of these systems, particularly those of Northpointe (acquired in 2011 by Canadian company Constellation Software). 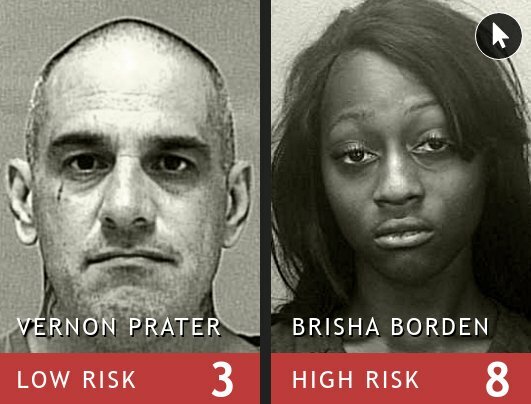 They confirmed that the software's predictions are racially biased and incorrect: that is, they score brown people as higher risk for reoffending than the actual reoffense rate; and score white people as lower risks for reoffense than they actually end up being. The issue is worse than racism, though. Because the training data and models used by Northpointe's system are not subject to peer review or even basic scrutiny, no one can challenge their assumptions -- meanwhile, the veneer of data-driven empiricism makes their numeric scores feel objective and evidence-based. It's a deadly combination, what mathematician and former hedge-fund quant Cathy O'Neil calls Weapons of Math Destruction -- her forthcoming book on the subject devotes a whole chapter to algorithmic risk-assessment.